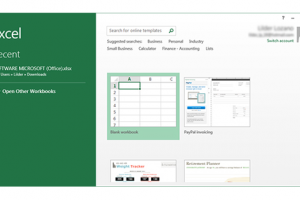 "Microsoft Excel | The spreadsheet solution that became a de facto standard"
Microsoft Excel is the renown spreadsheet solution belonging to the Microsoft Office productivity suite. Mastering Microsoft Excel has become a basic skill, often being a job requirement especially for accounting-related positions. Furthermore, there’s almost no higher education career that doesn’t rely on Microsoft Excel for one course or another. Any which way, there’s a wide range of reasons why you might be interested in downloading the latest version of this standard for spreadsheets, calculating, graphing, pivot tables and more. Microsoft Excel has become one of the standard office applications, hence included in all editions of the Microsoft Office suite, together with MS Word and MS PowerPoint. The latest version at the time of writing includes not only new features, but also new tools, such as improved multi-threading and memory contention, FlashFill, Power View, PowerPivot, Timeline Slicer, Windows App, Inquire and fifty new functions. Besides these, Excel has a myriad of options added over the years, enabling you to define cell appearance, character attributes and fonts, intelligent cell recomputation, auto-fill functionality, automatic incrementing cell contents or references while expanding the selection, and last but not least, extensive graphing capabilities. Furthermore, there’s also a wide variety of add-ins available on the market to extend this application’s “basic” functionality. If you’re new to spreadsheets you might need to invest some time to learn the basics, but with Microsoft Excel you’re set to learn the standard in spreadsheet solutions, so it’s worth the investment of time and effort. If you’ve been working with alternative spreadsheet applications, you might be enlightened to get your hands on Microsoft Excel at last. Microsoft Excel’s history goes way back to the eighties and the first release for Windows was in 1987, just in time for the early Microsoft Windows operating systems, leaving the DOS era behind where Lotus 1-2-3 reigned the market, taking over from the latter achieving a leading position. Visual Basic for Applications (VBA) was included from the 1993 release onwards, resulting in an integrated development environment (IDE) for user-defined functions (UDF) and macros recording for replicating actions. From 1995 onwards Microsoft Excel is part of the renown Microsoft Office for Windows productivity suite, alongside applications such as Word and PowerPoint. Another milestone is the year 2007 when Office 2007 saw the light. This meant the introduction of the graphical user interface change known as Ribbon interface and new file formats as well such resulting in the XLSX and XLSM extensions. Here you can download Microsoft Excel 2013 and although various decades passed, the concept of the earliest electronic spreadsheets hasn’t fundamentally changed. The interface did, but still cells, organized in rows and columns, are displayed with each cell containing either data or a formula.